Photograph 1 - We stopped here for a short break - Monterey, California. Not far from the main ocean front. 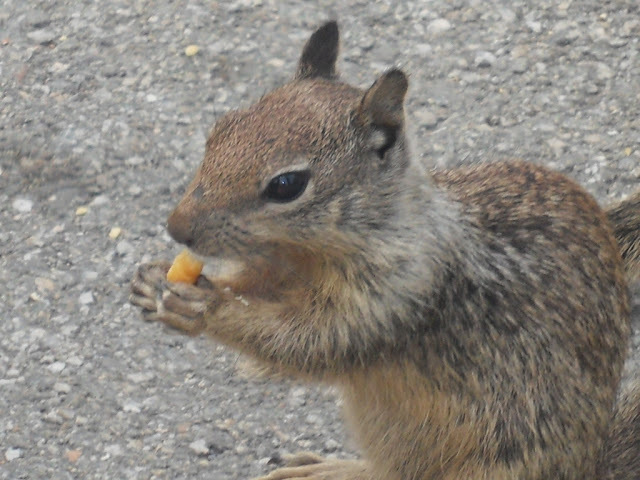 Photograph 2 - Charlotte in full flight - somewhere in Monterey, California. Photograph 3 - Along the Big Sur, California (between San Francisco and Los Angeles). 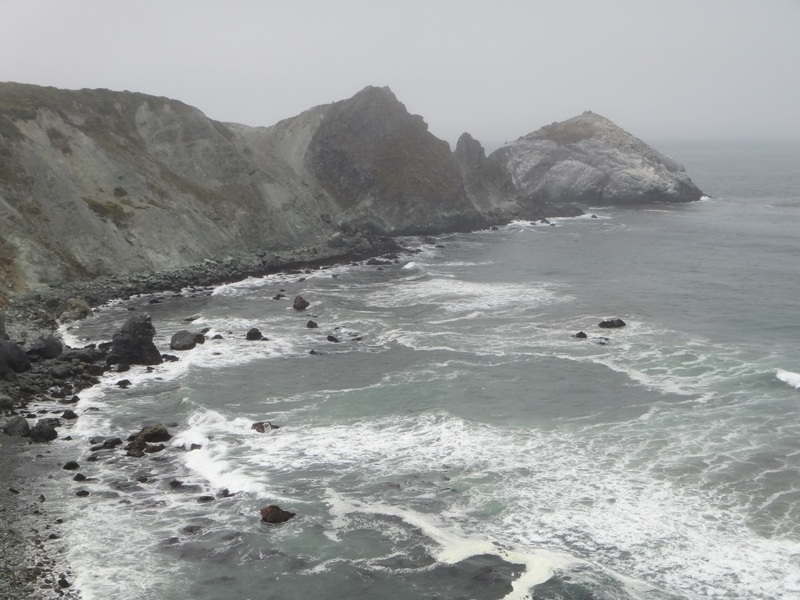 Photograph 4 - A Big Sur coastal view. 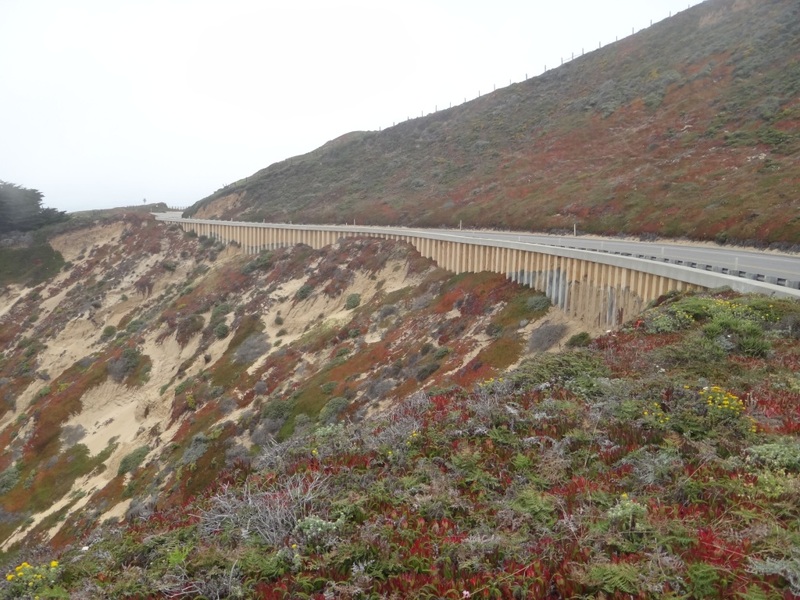 The road follows a rugged coastline and our visit was in extreme fog. Photograph 5 - "I'm watching you". 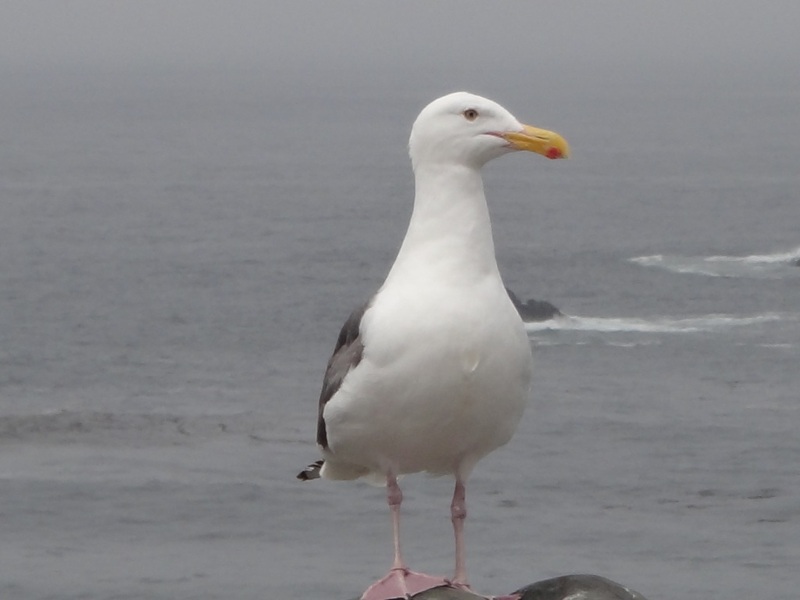 Near Point Piedras Biancas, Big Sur. 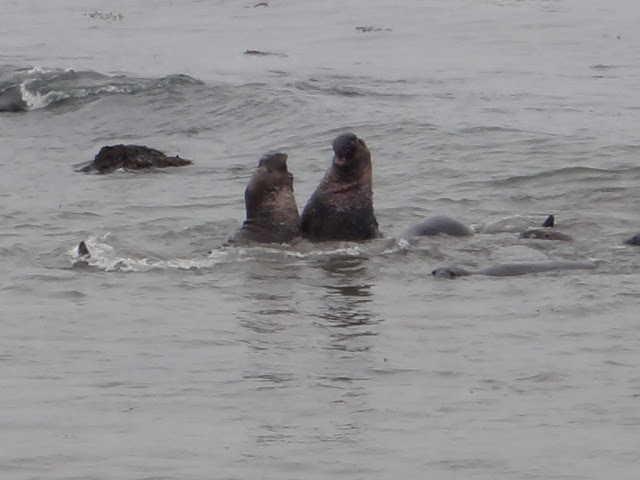 Photograph 6 - Elephant seals having fun near Point Padras Biancas, Big Sur. Photograph 7 - "Give me a break - I know my nose is ugly after a had a few beers". Elephant seals near Point Padras Biancas, Big Sur. 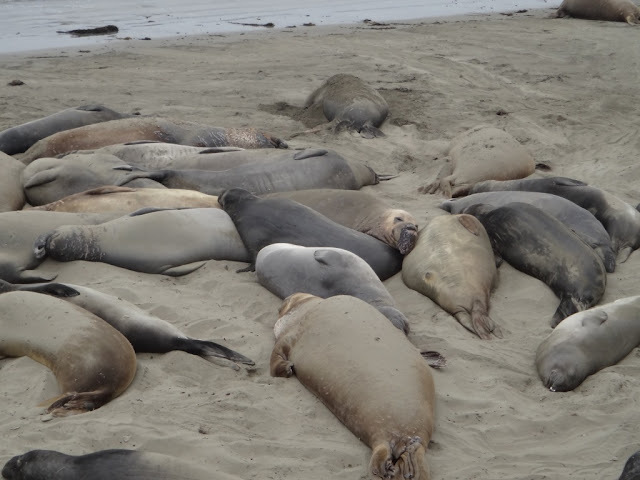 Photograph 8 - The elephant seal colony on parade - Point Padras Biancas, Big Sur. 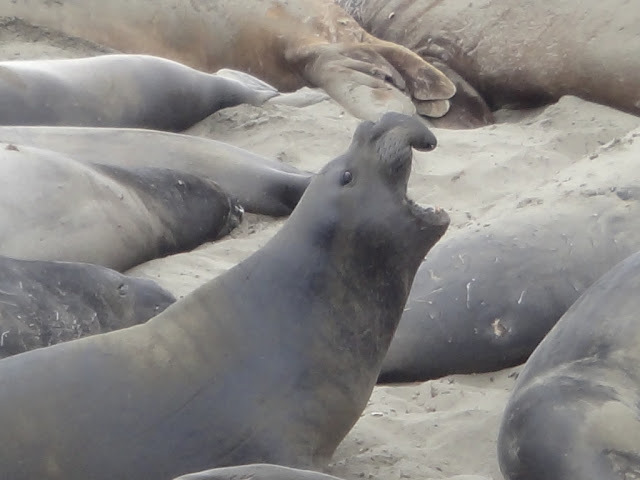 Photograph 9 - "Leave me alone I'm just yawning" Elephant seals near Point Padras Biancas, Big Sur. 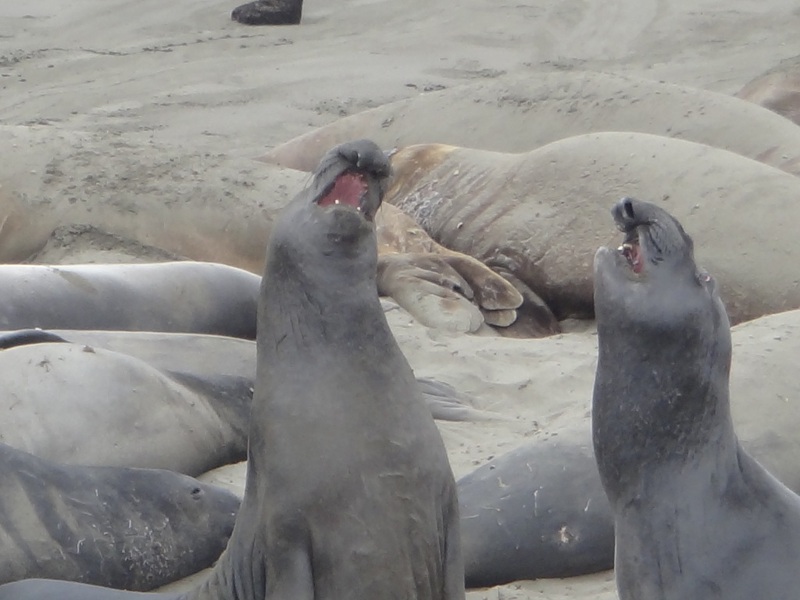 Photograph 10 - Two elephants seals in a dispute. Near Point Padras Biancas, Big Sur. 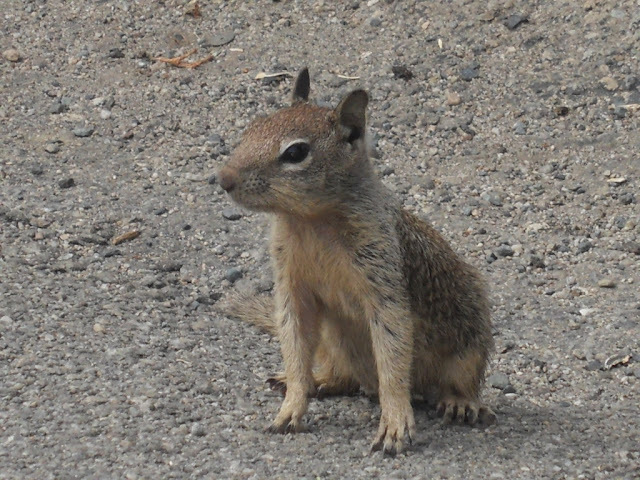 Photograph 11 - A ground squirrel posing for the camera. Near Point Padras Biancas, Big Sur. Photograph 12 - "Who me?" Near Point Padras Biancas, Big Sur. 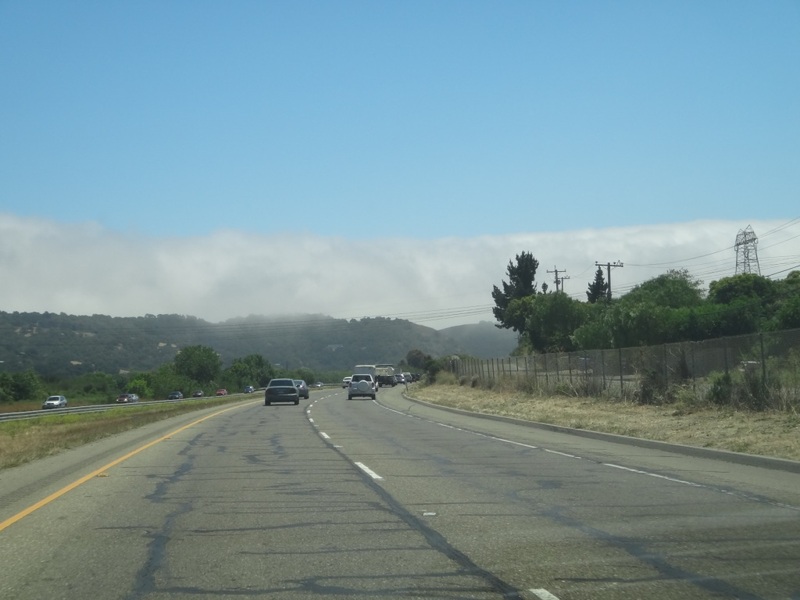 Photograph 13 - Driving near Cambria, California. The cloud in the background is coastal fog. Prevalent along the western USA coast at this time of the year. 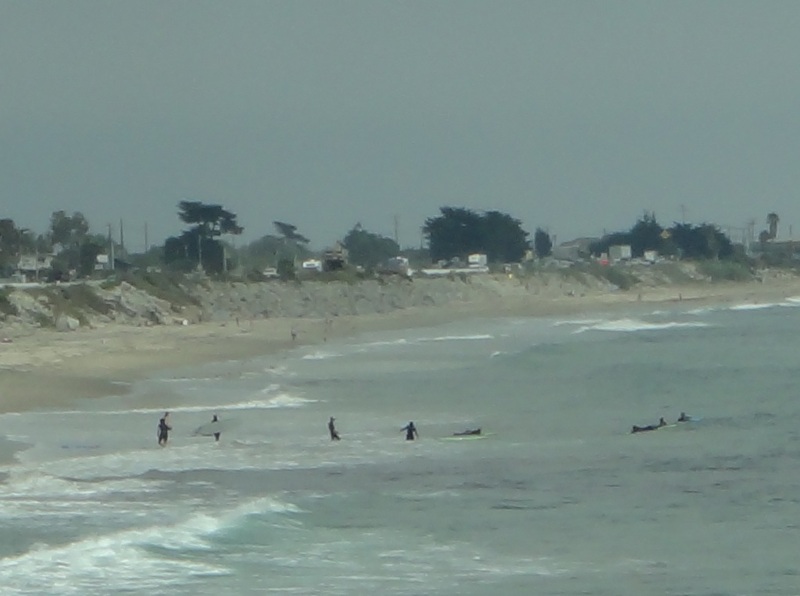 Photograph 14 - Surfers near Santa Barbara, California. Some of America's best mainland surfing locations. We left early at 7am and headed directly for Monterey which is the beginning of the Big Sur. Unfortunately the rugged coastline was in full fog. However, there were some locations where we could take photographs and recognise the precipitous cliffs that fall into the ocean. In some parts the road had been formed and actually butts out over the water - very impressive. 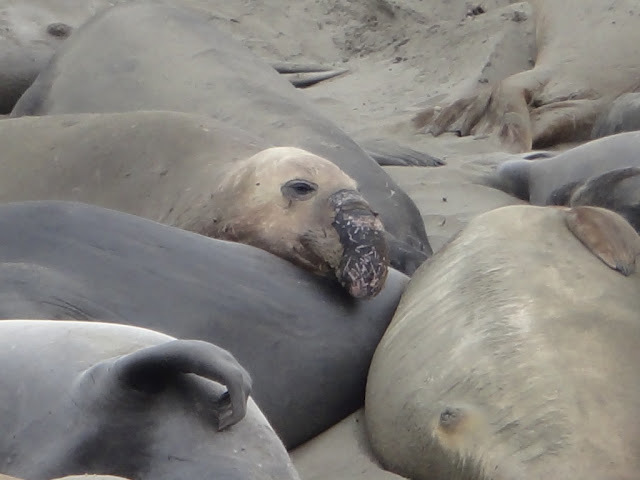 The highlight of the Big Sur was a spot near Point Padras Biancas where elephant seals were on the beach. They are actually young male (bull) seals resting and just cooling out. They weight about 400 kilos each and can move quite rapidly on the sand. In the water they are much in their glory. After leaving the Big Sur we found the main expressway to Los Angeles. 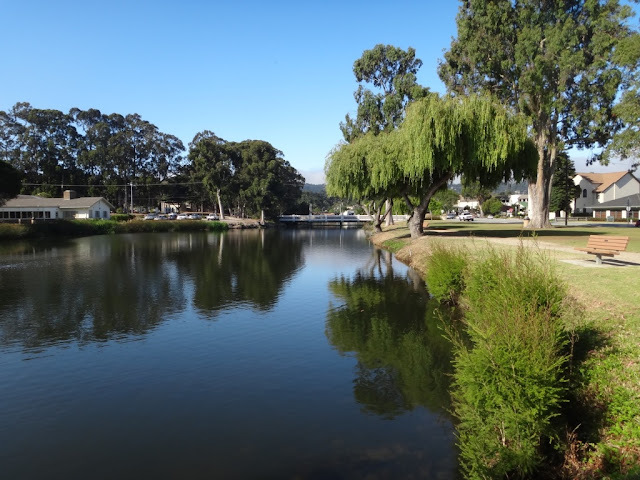 Stopped at San Luis Obispo for a picnic lunch. To enter LA from the north-west we followed the road along famous beaches - Pisco Beach, Santa Barbara and Ventura to name a few. As we entered the outskirts of LA the traffic was heavy. Slowing down from 65MPH to 20MPH for about 20klms. Notwithstanding this, the traffic was moving and we made it to our hotel about 5:30pm. 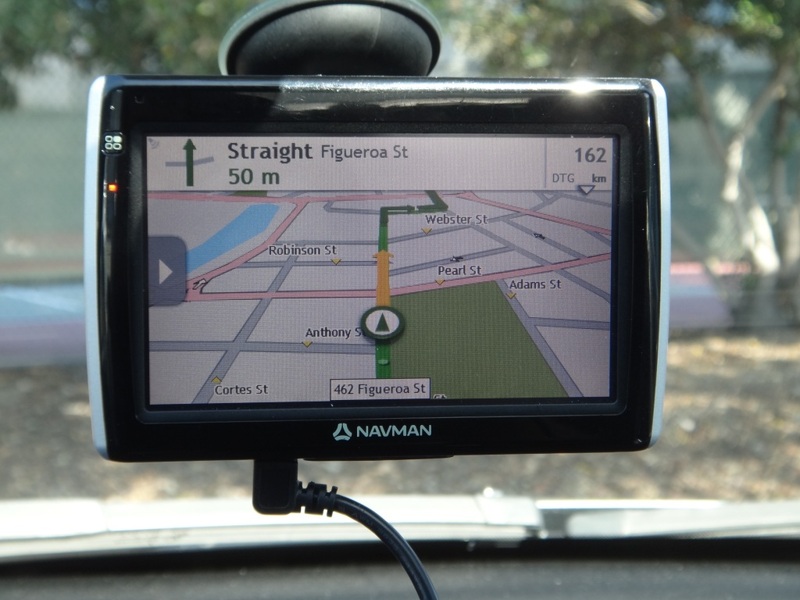 Los Angeles is a huge metropolis and if it wasn't for our Charlotte our GPS, we would be in deep strife. We are staying in Culver City which is not far from Beverley Hills and Downtown. We are in a Travelodge which gives us free parking, free wifi a refrigerator and a king size bed - what more can we ask for? The cost is $90 AUD per night - cool?? Tomorrow we are on a tour of the city and movie star tour. If we see somebody important like George Clooney or Merryl Streep we will give them an Ozzie gidday!! Cheers.